Congratulations on taking control of your hearing health. 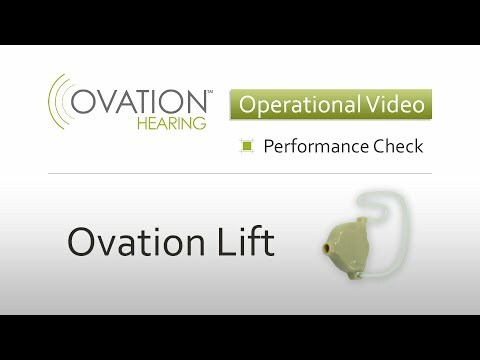 Please take a few moments to watch this Quick Start video to ensure proper use and care of your Ovation Lift Hearing Aid. Wearing your Ovation LiftTo place the device in your ear, start by gripping your Ovation Lift between your index finger and thumb. Then, use your index finger to place the device in your ear canal with the speaker pointed toward the ear drum. Lastly, curl the retention loop along the body of your ear. Battery LifeThe battery life for your Ovation Lift is about 7 days. You will hear a series of double beeps when the batteries need replacement. Changing BatteriesTo insert a new battery in your device, first use your fingernail to gently open the door on the back of your unit. Holding the plastic tab attached to the battery, place the new battery in the battery compartment and carefully remove the plastic tab. To fully activate the battery, wait for about 2 minutes before closing the battery door. OperationThe battery door serves as the On-Off switch for your Ovation Lift. If the battery door on your unit is open, your device is OFF. If the battery door on your unit is closed, your device is turned ON. Program SettingsYour Ovation Lift Hearing Aid offers four different program settings, allowing you to hear comfortably in nearly any listening environment. To change programs, simply the tap the outer part of your ear two times. The unit will beep to let you know which setting has been selected. CleaningTo ensure optimal performance of your Ovation Lift, it is important that you change your wax guard filter at least once per month. Start by gently screwing the threaded end of the changing tool into the wax guard on your device and pulling out the old one. The old wax guard can then be disposed of. Then, push the other end of the changing tool – the side with the smooth tip – into the dispenser to pull out a new guard. You can then insert the new wax guard into your Ovation Lift. We hope you found this Quick Start video helpful and that you'll once again begin to enjoy all of the sounds you've been missing.